To respond to Christ’s call demands maturity and a time of examining the reasons for which one desires to enter religious life. That is why the Church requires sufficient time for discernment and formation before professing public vows. What formation process does the Union-Chrétienne de Saint Chaumond provide ? Religious formation is based on five main pillars : spiritual, intellectual, human, community, and apostolic. Therefore, the young woman must be formed in each of these areas so that she can acquire sufficient maturity in order to live a responsable religious life and fully honor her definitive commitment in service of God and of the Church. Postulancy. “Come and see” (John 1 :46). This is a time of discernment that lasts for six months to a year. 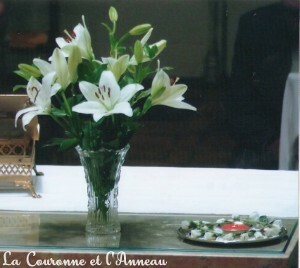 The young woman participates in the apostolic life of the Institute, begins to experience community life, and validates her decision to follow Christ according to the spirit of Union-Chrétienne. She completes her human formation and deepens her baptismal consecration. Novitiate. “I bless the LORD who gives me counsel; in the night also my heart instructs me” (Ps. 16 :7). This stage which lasts one to two years marks one more step taken in the Institute. To demonstrate God’s call within her, the postulant receives a new religious name as well as a habit upon her entrance into the novitiate. In order to experience more deeply the life of the Institute, she receives formation on the interior life, she cultivates the virtues of humility, docility to the Holy Spirit, and of a gift of self. She continues her human, spiritual, and community formation to learn to listen to the Lord better, keep his Word, and put it into practice in order to follow Christ in a more radical way through the Evangelical Counsels. She deepens her interior knowledge of the history, charism, and rule of the Institute. She thus prepares to profess temporary vows. Temporary Profession. “In this is love: not that we have loved God, but that he loved us and sent his Son as expiation for our sins” (1 John 4 :10). 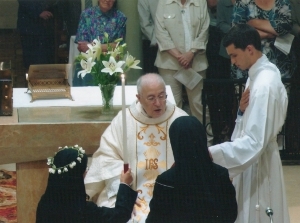 After her temporary vows (first vows) issued for three years, the young professed sister completes her formation in many different theoretical and practical areas so that she can participate more fully in the mission and apostolate of the Institute. A formation curriculum (spiritual, intellectual, community, and apostolic) is proposed to the young professed sisters according to their aptitudes so that they may better live out their vocation. The vows can be extended twice for a period of two years each if it is deemed necessary for the sister to acquire the maturity assured for her fidelity. 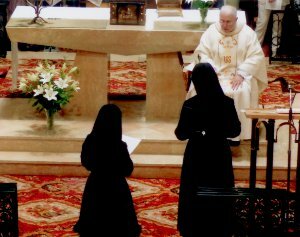 The temporary professed sister wears the habit of the sisters, the black veil and cross, a symbol of her self-gift to her Savior. Perpetual Profession and Ongoing Formation. “Seek the LORD and his strength; seek his presence continually” (Psalm 105 :4). Religious formation does not end at perpetual profession. Her entire life, she searches for God so as to accomplish more perfectly His will. That is why continuous formation nourishes each sister’s comtemplation, fostering the implementation of the Evangelical Counsels, and constantly renewing her in the apostolic mission.